Today’s post is a short and simple one. No system is error free. The key is in providing easy and efficient mechanisms to capture these errors and enabling the users of the system to extract meaningful information from these error logs. 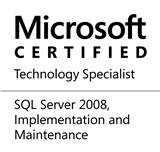 This entry was posted in #SQLServer, Blog, Imported from BeyondRelational and tagged #SQLServer on March 28, 2012 by nakulvachhrajani.